Approximately 4.7 million people are attacked and bitten by dogs in the United States each year. Of these, approximately 800,000 victims require medical care for the injuries sustained from the attack, and between 10-20 victims die. Roughly 30% of attacks involve unrestrained dogs off the owner's property, 22% involve a restrained dog on the owner's property, and 48% involve an unrestrained dog on the owners property. A frequent target of dog attacks is the face, accounting for approximately 44,000 injuries in US hospitals each year. Injuries to the face include abrasions, tissue loss and avulsion, lacerations, crushing wounds, punctures, and fractured bones. Other frequent targets include hands, arms, and lower extremities. These injuries can result in permanently disfiguring scars. Further, injuries from a dog bite resulting in wounds are likely to become infected. Over half of those attacked are children. Indeed, it is estimated that a child has a nearly 50% chance of having a serious dog bite by the time they reach the age of 14. One in ten dog attacks involve sleeping infants. Dog attacks are so common that almost one in three claims against a homeowner's insurance involve a dog bite. In 1994 alone, insurance companies paid approximately $1 Billion for injuries resulting from dog attacks. 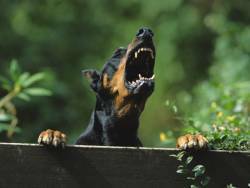 Typically, victims of of a dog attack have a limited period of time to pursue a claim. If you have been bitten by or otherwise injured by a dog, it is important to immediately consult with an attorney.